To reach this cemetery from Florence, Alabama, travel Alabama Highway 20 West for 19 ½ miles. Turn right (east) onto County Rd. 8 and go about 1 mile. The Cody Cemetery is located on the left in a wooded area about 50 feet off the road. The cemetery has a fence around it. 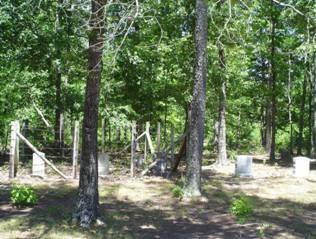 This cemetery lies in western Lauderdale County in a wooded area, but can be seen from the road. Although trees surround it, it is not grown up and deserted. Cody, David; b. 29 Jan 1872, d. 02 Jul 1897, son of G. W. & R. L.
Cody, Fanney; b. 13 Aug 1883, d. 17 Nov 1884, daughter of J. B. & E. J.
Cody, Leonard; b. 07 Sep 1905, d. 16 Feb 1911, son of I. B. & M. J.
Cody, Wayne; b. 04 Jul 1880, d. 29 Aug 1897, son of G. W. & R. L.